– It’s been 2 months since the start of the protest movement in Bosnia and Herzegovina, what is happening with this movement now? Do people still organise citizens’ Assemblies [Plenums] and does the government hear your requirements? A lot of things are happening now. 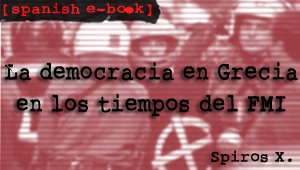 Various elements are involved: a strong police repression, political and media propaganda, etc. In the beginning, plenums had some positive energy. But now, Non-Governmental Organisations [NGOs] have taken control of the plenums. They do not ‘impose’ their organisations, but they criminalise protesters at the Plenums. There were allegations against demonstrators who manifested their anger through direct actions. So, plenums are currently discredited. The government is no longer afraid either of the plenums, which have no power, or the demonstrators who peacefully express their dissatisfaction. When we gathered to express solidarity to people arrested during the protests, representatives of NGOs began to divide the protesters to ‘good’ ones and ‘bad’ ones. When comrade Nihad was arrested, we tried to get the support of the Plenum, but the organisers and activists from NGOs said that Nihad had to pay for throwing Molotov cocktails. Also, we initially thought that the people arrested on February 7th were 33 (as we were told), but updated information showed that the number was twice as big. Police claimed they had released all those arrested, but this wasn’t true. In police stations in Sarajevo, there were a lot more arrested boys who had been beaten and humiliated by the police (An interview with an anarchist who was among those who remained in jail, after police and media reported that all arrested are released, can be found here). So, today, Plenums no longer have any point. Members of NGOs who have taken control of the movement, have crashed its philosophy, as they began to bring politicians to the plenary sessions, including the representative of the international community –Valentin Inzko–, Nicholas Hill from the U.S. Embassy and the delegate of the Italian Parliament. Why? The only logical explanation I can see in the NGOs’ monopoly over plenums is a plan to use it for their projects and the financial support from the US (USAID, NED, etc.). And it’s no secret that members of the NGOs are associated with the U.S. embassy in Sarajevo. The plenums’ failure can be seen in that – first few sessions of Plenum gathered several thousand of protesters who wanted their voices to be heard. Today, there is not even 100 people. Many people left Plenums because they know how NGOs work – and they do not trust either the political parties or NGOs anyone. – Various people were coming to the Plenums – students, workers, war veterans. How do people react to all the events and protests now? How do they react to the presence of NGOs? When protests were violent, many people who had been to the war were –on one hand– shocked and scared, but most of them accepted the fact that this was the only way for us to be heard. But I believe things have evolved through protests and plenums –people begun to think in terms of class, rather than national– and talk about social justice. Something about which there was not even a word in Bosnia for the last 20 years. As I have said already, it’s no longer secret that NGOs belong to political parties and are connected with the U.S. Embassy. People generally do not trust NGOs’ activists and gave up the protests and the movement, because they are affected by them. Since there is no stable platform / informal organisation that would bring people together -people who are against the NGOs policies-, the movements simply died out. – The whole movement in Bosnia was spontaneous. Weren’t there any influences by any NGO? 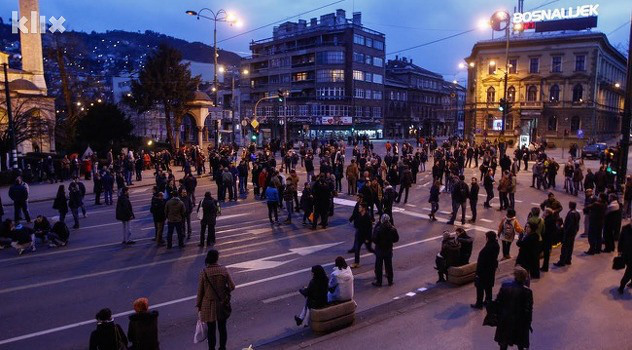 In Sarajevo, people gathered (in the beginning) to express solidarity to the workers and protesters in Tuzla, because the movement in Tuzla had suffered brutal police repression. Of course, that repression, from throwing people into the river, to arresting them for terrorism, spread also to Sarajevo and other cities. We are currently working on creating an alternative space for people to gather, share their ideas and mobilise, without the influence of NGOs. People here are very skeptical about politics, to the extent that if you mention the word ‘organisation’, they will immediately think that you work for some party. They still hold to the fact that you can be absolutely uninterested in the political situation, or work for some party. Therefore, it is essential to have a place –not an organisation– which would be free of the parties and/or NGOs. And people outside Bosnia often talk about the “Bosnian revolution”, but there is an evolution there. Because of ethnic and national divisions, people never talked about class struggle – now they do. Now we see Muslims and Croats fighting on the same side of the barricades. People begin to realise that they are all the same – with the same/similar problems. And for these problems the whole system- not just a party or a leader – is responsible. – Could the rebellious spirit be expanded on the Serbian part of Bosnia? There weren’t mass protests. In the beginning, there were protests organised by several NGOs in ‘solidarity’ with us in Banja Luka. But a few weeks ago, veterans gathered in solidarity with the rebellious people in the Federation of Bosnia (note: Bosnia is divided on 2 parts – Federation of Bosnia and Republic of Srpska). And this is a huge step for us, because there is a real political propaganda which divides people into ethnic groups and people finally realised that our blood yields profits to politicians. – People in Bosnia are not too acquainted with anarchy. 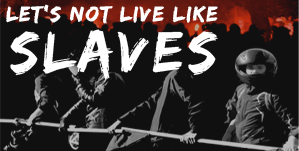 Has the anarchist movement in Bosnia evolved after protests? Did it gain significance? People who attended the protests began to create a positive image of anarchism. Before the protests, NGOs loved to play with the term ‘anarchism’ and generally it didn’t get much sympathy. Today people realise that there is a real movement and real anger. The movement definitely began to develop rapidly. People are sick of politics and they started showing interest in anarchism. And not only young people, but all generations. After the war, because of nationalism and all the crap in which we got stuck, there wasn’t space for anarchism. Now, this is its moment. – What is the basis of dissatisfaction in Bosnia? We don’t have anything here. The average salary is 150 euros per month. Minimum wage is 20 euros per month. Minimum pension is 1 euro per month, and the average is around 120 euros per month. There are no benefits for students. After finishing their studies, people get jobs completely irrelevant to their profession and most people remain jobless. At the same time, Bosnian politicians are among the best paid in Europe. Corruption is a major problem here and politicians with their nationalist discourse have shifted the attention from these problems. Today, among the people of Bosnia, including those who have survived war, nationalism is no longer a popular “idea”. Today, we are all together against capitalists and their policy. – How do you see the future of Bosnia? The only solution is the complete destruction of the existing system. People are sick of this system which is the product of war. This system is designed to divide people and spread hatred among the various ethnic groups. But behind these masks, politicians are fully consistent in actually having no problem with nationalism in their private life. For example, the RS (Republika Srpska) president’s son is married to a Muslim, with which Milorad Dodik (president of RS) was thrilled. But apart from that, he insisted that this movement is a threat for the Serbians, lying to the people that we bought weapons to attack the Serbs and the RS. Regarding the RS, if Bosnian Serbs want their independence, they have a choice. We will do everything to develop the movement. 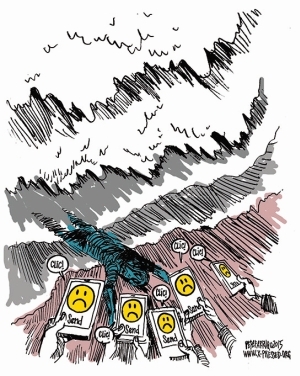 People now really have a choice – to change or to continue life in this system of hate. In Tuzla, workers started to organise Plenums in factories. In Bosnia there are unions, but they all belong to political parties. And of course, there is the law under which employees must sign that they will never strike in order to get a job. Otherwise, they can go to jail. For example, one member of Special Forces during protests took off his helmet and asked us to stop throwing rocks at them, because they understand our anger and do not want to use force against us, but also they cannot come on our side, because they can risk 15 years in prison for that. Of course, I do not justify the cops –they are what they are– but it must also be understood that one part of the police force is different in Bosnia than in Europe. Many cops, older than 40 years old, defended the city and were part of the Patriot League during the war. They were the people who defended their friends and family, and now they are on the opposite side of the barricades – as well as those against whom they once fought. Today – they are the enemies. – Do you still have comrades who are in prison? Yes. Six comrades were arrested one month after the demonstrations. But, none of them are in prison except Nihad; they are, though, accused of terrorism and are awaiting trial. We don’t know the exact reason why Nihad wasn’t released along with them. Like all comrades, Nihad claimed responsibility for attacking government buildings. He is charged with terrorism and therefore he can get 10-20 years in prison. Nihad, as every other citizen of Bosnia, has good reasons why he did that – he hasn’t received his salary for 5 months. And that’s not an exception, it happens often that people do not get the money they have worked for. Currently, we have lawyers handling the cases of these six persons accused of terrorism. And the only thing we can do now is to inform people, take solidarity actions and wait for the trial. On the 7th of April, Nihad is to be released, if the judge doesn’t decide once more to keep him in custody. We have no idea what will happen, but whatever happens – we will stand by him and we are ready to help him in any way. Active support to Nihad! – Thank you very much for your time, Lo. I wish you a lot of strength and luck in your struggle. Thank you twice and see you on barricades.